On this day the guide will drive you to Eastern Uganda at Mt Elgon. You will start your tour with a visit of the famous Sipi falls immediately on arrival. After being showered in pleasure at the water falls go to the Kitum Cave. Its overhanging crystalline walls enter 200 meters into the side of Mt. Elgon. You will have dinner and spend your night at Sipi Falls Rest Camp. On this day get prepared to climb the highest peak of Mt. Elgon Koitoboss, 13,852 ft high (4155 m). It is easily accessible by hikers in about 2 hours from the road side. Then follow the vehicle routes up to get panoramic views on various animals such as Columbus monkeys, elephants, black-and-white squirrels and blue monkeys. You will have dinner and spend the night at Sipi Falls Rest Camp. On this morning you will start your journey to Kidepo National Park and reach your destination early enough to have lunch at Apoka Lodge. In the afternoon, you will enjoy the panoramic views of the Narus river valley as well as the wildlife seen right from the verandah of the lodge. Enjoy dinner and night at Apoka Safari Lodge. Take a morning game drive to Kanangorok hot spring after an early morning breakfast. Kidepo Valley National Park harbors a total of 86 mammal species, which makes it the National Park with the third highest number of games in Uganda. 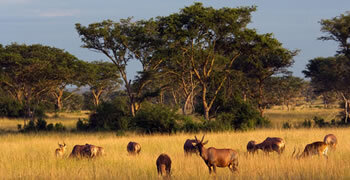 It protects a far greater variety of large mammals than any other national park in Uganda. There are 28 species found nowhere else in Uganda. There is a checklist counting463 confirmed and 26 unconfirmed bird species. After having lunch at the lodge you will proceed to Karenna and Kadepo for a cultural performance given by the native Karamajong people. Enjoy dinner and night at Apoka Safari Lodge.. The guide will pick you from Entebbe airport and drive you to Kampala. After lunch he will guide you through the famous Kampala City Tour. Later on, you will tour black rhinos in a semi-natural environment. 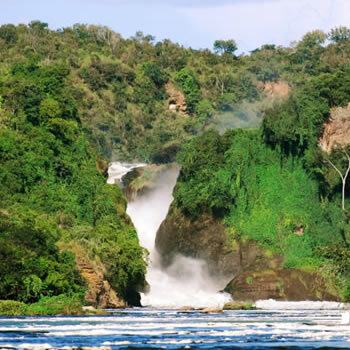 Then we will take you to Murchison National Park falls in the evening and you will take a ferry to Paraa Safari Lodge. Dinner and night will take place at Paraa Safari Lodge or Budget Red Chili Camp. In the morning go to Kaniyo Pabidi in Budongo forest for chimpanzee trailing and forest birds such as the white-thighed hornbill, chocolate-backed kingfisher, chestnut-winged starling, trogon, narina and puvelsilladopsis which is found nowhere else in East Africa. You will go back to the lodge for lunch and enjoy a boat cruise at the bottom of the Murchison falls in the afternoon. The cruise to the base of the falls is the highlight of most trips to Murchison Falls, but the cruise from Paraa towards Lake Albert delta is best for bird watchers because it gives a great opportunity to see shoebills, especially during the rainy season. You will see hundreds of hippos, the largest crocodiles in Africa, black-and-white colobus monkeys, small herds of buffalo, bushbucks, waterbucks, kobs, giraffes, elephants, and if lucky lions and leopards. Day 7: Game drives Murchison Falls National Park. This morning you will embark on a game drive in the north of the River Nile following a delta trail that runs west from the Paraa ferry to the Lake Albert delta. The 20 square km area of grassland bordering the Victoria Nile delta which flows into Lake Albert is a great attraction to any visitor. 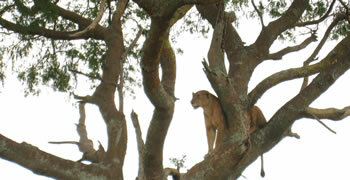 You will have a game drive on your way back to Kampala with a car or a chartered flight. Enjoy dinner and night at The Lodge-Lweza for an easy ride to Entebbe Airport.